Decision 2012 has been made, but it is hardly the equivalent of the classic chess move of castling. Rather, Medvedev seems to have been set up for a sacrifice. The moment of Decision 2012 has finally arrived. Last Saturday, addressing the cast of a costly show called the XII Congress of the United Russia party, Russian President Dmitry Medvedev announced that he was not going to run for re-election. Instead, Medvedev proposed that United Russia nominated its leader and the current Prime Minister Vladimir Putin as a candidate for the next year’s presidential election, something that would ensure Putin’s return to the Kremlin. Returning the favor, Putin promised to make Medvedev the head of his next cabinet, should United Russia win the upcoming December Duma elections, as widely expected. Will the swap of positions in the tandem result in a further government shake-up, or stagnation? Some analysts in Russia, where the game of chess is a popular pastime, dubbed the announced arrangement “castling.” Those really familiar with the game would hardly agree: Castling involves two chess pieces, the king and a rook, simply exchanging their positions on the chessboard. In contrast, the proposed leadership “swap” will fundamentally shift the balance of power in the Kremlin: In chess terms, it will bestow on Putin the importance of the king combined with the power of the queen, whereas Medvedev’s role will be reduced to that of the bishop, a piece that is often sacrificed for tactical reasons. It is possible to argue that Putin’s return to the presidency would resolve the most important controversy in Russian politics. Putin is, and has been for years, the most popular Russian politician, as evidenced by multiple polls. In 2000-2008, his popularity matched his position as president, the highest state position according to the Constitution. However, in 2008, this “harmony” was distorted as Putin moved to the post of prime minister, formally subordinate to the president. The “tandem” between Putin and Medvedev was created to manage this distortion, with some original hopes expressed that the new structure would introduce a modicum of competition between two executive offices, the presidential administration and the Cabinet. But the arrangement proved to be too confusing for Russian elites. So, no matter what Putin’s critics will say – and, to be sure, there is going to be a tsunami of condemnations of his “authoritarian instincts,” both within Russia and abroad – Putin is returning to the position commensurate with his real status as a “leader of the nation,” a position that he would have easily won in any free and fair election. Medvedev’s proposal to nominate Putin as United Russia’s presidential candidate was greeted with a standing ovation by the congress delegates, to which Medvedev observed that their reaction gave him the right to provide no further justification of Putin’s nomination. As far as Putin is concerned, Medvedev is right; but he is wrong if he believes that he owes no explanation about himself. 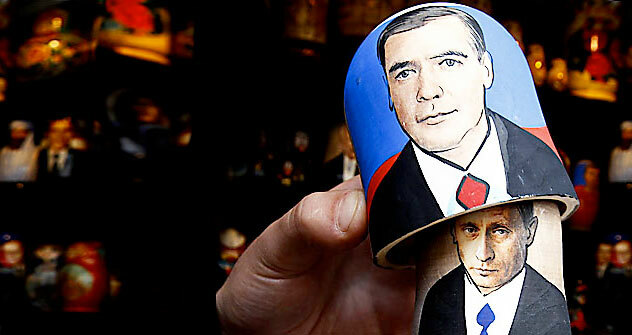 Medvedev has just earned the dubious honor of becoming the first single-term president of Russia. And it begs the obvious question of: “Why?” Medvedev showed strength and resolve during the August 2008 war in South Ossetia; he successfully navigated Russia through the stormy waters of the world economic crisis; he initiated a reform, however timid, of Russia’s broken judicial system; he improved the country’s image abroad; finally, he sharpened public consciousness with his modernization rhetoric. By all accounts, Medvedev’s first term in office was not a failure. Doesn’t Medvedev feel that he must explain – to his supporters, to the elites, to Russian voters – why he chose not to seek re-election and why, in his opinion, Putin will be better as the next Russian president? Actually, Medvedev did provide an explanation of sorts. He told the delegates that the Decision 2012 was actually made a few years ago, at the time when Medvedev and Putin were forming their tandem (a “comrade union,” as Medvedev put it), and he was therefore just delivering on what was agreed upon between the two back then. There is a problem with this explanation. Over the past couple of years, when asked about his plans, Medvedev has repeatedly expressed his interest in the second term and kept saying that the final decision would be made based on the situation in the country and the results of his own work. With the decision made in fact back in 2007, has Medvedev been not deliberately deceiving his compatriots? In recent months, there has been pressure on Medvedev to announce his re-election bid and to use the time before the March presidential election to mobilize the electorate around his modernization agenda. Medvedev’s announcement Saturday not only shattered high hopes that some in Russia have had for him – it has essentially transformed Medvedev into a lame-duck president a good half-year before the official end of his term. While Russians are readying to watch the Putin gambit, Medvedev’s game is precipitously turning into unwinnable endspiel. Eugene Ivanov is a Massachusetts-based political commentator who blogs at The Ivanov Report.